This barn stands at right angles to the road entering Peasemore from the south. Although Peasemore is a medieval settlement, this barn probably dates to the seventeenth century. It is ten bay, timber-framed, barn with aisles added later. 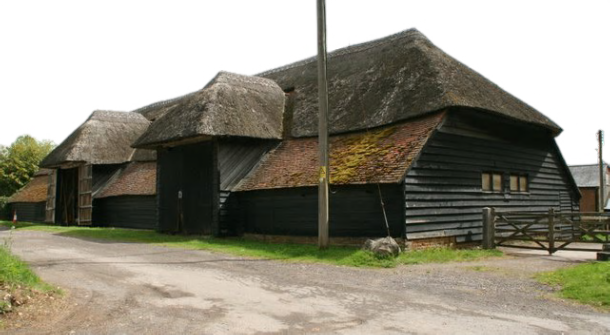 The main barn is thatched and the outshuts or aisles are tiled with clay tiles. It has clapboard cladding. It backs onto a farmyard with cowsheds and other buildings round it. It is no longer in agricultural use, and the current tenant allowed me inside to photograph it.